At Malaga airport have been allocated more than 600 parking spaces expanding the amount and quality of the existent parking modules. From now on, users can choose among the new ‘parking Express’, long term parking and VIP (‘Valet Parking’). The aim is to suit all needs and respond to the demands of passengers. Outstanding is the new long term car park, which covers over 8,500 square meters north of the airport, next to the cargo terminal, and which is ideal to leave the vehicle for long periods at very competitive rates. It is an inexpensive, convenient and accessible service with free minibuses which connect in just three minutes the parking with the terminals. The idea is to meet the demands of travelers living in Malaga, national or foreign, second home owners or passengers traveling on business or sightseeing with a medium or long term stay. Another modality available at Malaga airport is the service of VIP parking, targeted at executives, customers of business class or high-level tourists who, regardless of how often they travel require unique features at all levels, from agility and speed to discretion or convenience. This is a unique service where the user only has to leave the car keys at the entrance of the terminal and forget about the rest. In addition this service provides additional services, like repairing the vehicle, pass the MOT or revision at the selected dealer, interior cleaning and refueling while the passenger is traveling. Malaga terminal also has considered users who appreciate speed. For them is available the parking Express, which is saving time parking the car or to accompany the traveler more comfortable and faster. 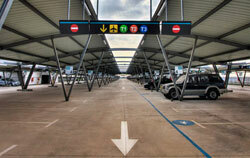 The more than 600 spaces for VIP parking, express parking and long term parking add to the nearly 3,000 spaces distributed among the various parking areas available at the Malaga airport grounds.